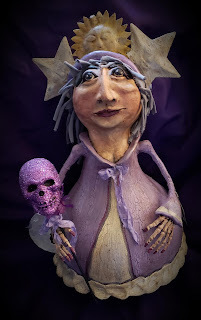 Celestial Witch..EHAG Emporium update Tonight! This gal is done in sun, moon and stars. She has painted, metal Sun and 2 stars for her crown. Her hair is cut t Shirt material wrapped around her head. Her Scepter is a glittered skull with a painted metal moon attached. To purchase, you can email at howlingmoondesigns@att.net and I will send you a Paypal invoice.